Adding a pinch (5g) of fairly pricey Rushmore (a beautifully deep-red oakleaf) to a batch of salad mix. This is the basic all-lettuce summer blend: seven varieties, selected mainly for color (greens to reds), texture (flat to frilly), and to some degree, seed cost (the price range of lettuce varieties is quite extreme). 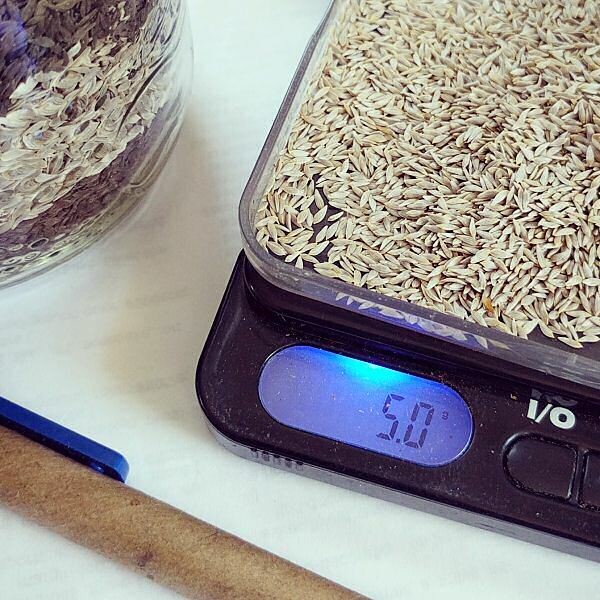 This inexpensive digital gram scale makes it easy to add relatively small quantities of certain varieties, and keep each batch consistent. Weigh out, shake up in bottle, ready to go. Here: 100g – that’s a lot of little lettuce!